The tomb belongs to “Wahtye”, a high priest who served during the fifth dynasty reign of King Neferirkare. EGYPTIAN ARCHAEOLOGISTS HAVE discovered the tomb of a priest dating back more than 4,400 years in the pyramid complex of Saqqara south of the capital Cairo, authorities said today. “Today we are announcing the last discovery of the year 2018, it’s a new discovery, it’s a private tomb,” Antiquities Minister Khaled el-Enany told an audience of invited guests including reporters. “It is exceptionally well preserved, coloured, with sculpture inside. It belongs to a high official priest… (and) is more than 4,400 years old,” he said. The tomb belongs to “Wahtye”, a high priest who served during the fifth dynasty reign of King Neferirkare, the antiquities ministry said. 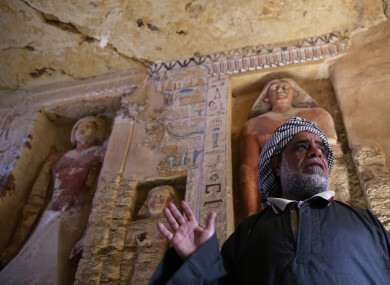 His tomb is decorated with scenes showing the royal priest alongside his mother, wife and other members of his family, the ministry said in a statement. It also contains more than a dozen niches and 24 colourful statues of the cleric and members of his family, it said. In November archaeology officials announced the discovery in Saqqara of seven sarcophagi, some dating back more than 6,000 years, during excavation work started in April by the same archaeological mission. Three of those tombs contained mummified cats and scarabs. The Saqqara necropolis south of Cairo is home to the famous Djoser pyramid, a more than 4,600-year-old construction which dominates the site and was Egypt’s first stone monument. The tomb, built by the master architect Imhotep for the Pharoah Djoser, stood 62 metres tall originally and is considered the oldest building in the world built entirely of stone. Email “Archaeologists unearth 4,400-year-old tomb of Egyptian high priest”. Feedback on “Archaeologists unearth 4,400-year-old tomb of Egyptian high priest”.